Trying to find that next mattress that will help you sleep like a dream? Mattress stores in Kentucky may be hard to come by for some given the rural nature of the state﻿. For those of you not wanting to drive into the city, there is always the option to buy online from a proven online mattress company. 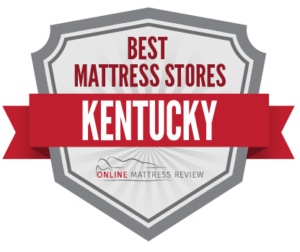 If you’d rather try out your mattresses, check out our guide to the best mattress shops in Kentucky. If you are looking for a the best mattress stores in Kentucky, you have come to the right place. We understand that shopping for a mattress can be daunting. There are a number of ways to purchase a mattress including through mattress-in-a box companies, large chains, and small mom and pop mattress shops. With the saturation of the market, it’s difficult to sift through what’s good and what is not. What we discovered on our venture for the best mattresses was it was more than just about quality of product, but also about quality of service. We combed through the internet and surveyed the top-ranked mattress shops in Kentucky. From there we divided our findings into regions that spanned the state and highlighted only the absolute best. We rated “best” by quality of product, quality of customer service availability, and other convenience perks like swift delivery and money-back guarantees. We also noted that unlike 10 years ago, mattress stores are everywhere. So if you’re like many consumers who simply must try their product before they purchase, there is no need to head all the way out to Louisville and or Lexington as today you can find mattresses in smaller towns as well like Hopkinsville, Frankfort, Mayfield, Madisonville, Calhoun, Mount Washington, and more. For the top mattress stores in the most populated regions see below. If you are looking for the best mattresses in Louisville, we can help. Bowles Mattress (743 E. Broadway) offers a huge selection of mattresses and sizes. The sales team are friendly, knowledgeable and patient. Also, this is one of the few location in the state where you can find an organic toxin-free mattress. For those living in Irish Hill, head to Furniture Dudes (1134 Lexington Rd.) where you’ll find a great relaxed sales team that can help you navigate the wonderful world of mattresses- with ease. We also appreciate their same-day delivery. Mattress Firm Clearance (2520 Hurstbourne Gem Ln.) provides affordable mattresses, quality products, and a 120 day guarantee. Sleep Outfitters (7619 Shelbyville Rd.) was founded by a Louisville-native in 1983. Today, Sleep Outfitters continues to provide quality mattresses, competitive pricing, and great customer service. Are you wondering: where can I find a mattress near Lexington, Kentucky? We are here to help. The best mattress shops in Lexington offer a wide-range of mattresses, competitive prices, a knowledgeable and friendly customer service team, and reliable shipping. Head to Mattress Firm Lexington (2925 Richmond Rd.) where you will find over 50 mattress of varying firmness and quality materials as well as Mattress Firm’s 120 day money back guarantee. The sales team are accommodating and friendly, and patient. If you are looking for a no-pressure sale, try here. Sleep Outfitters (1760 Harrodsburg Rd.) has the sales team of your dreams. This group works hard to make sure that you find a mattress to fit your needs and your budget. They provide convenient and reliable delivery services. There’s an additional quality Sleep Outfitters located in East Lexington (2303 Woodhill Dr.). If you are looking for a locally run mattress shop, head to Wildcat Mattress (2040 Lexington Rd.). This mattress shop is known for its customer service, quality of product, and great affordable prices. For many shopping local is more than just a nice gesture, so if you’re looking to avoid big chains, you’re in luck with Wildcat Mattress. If you need to find a mattress in Bowling Green, you’re in luck- there are a number of quality options. Trent Bedding is located in the heart of Bowling Green (1751 Scottsville Rd.) just across from the TriStar Greenview Regional Hospital. Trent Bedding offers quality customer service, a wide-selection of mattresses and other items for your bedroom as well as reliable delivery. If you are looking for a no-fuss solution to your mattress needs, try here. Sleep Outfitters is popular in Kentucky as the founder is a Louisville native. The location in Bowling Green (1689 Campbell Ln.) offers a number of well-known name brand mattresses, a lowest price guarantee and fantastic customer service. When seeking out a mattress near Bowling Green you could try Jacob’s Home Furnishings in Brownsville (3981 Kentucky Hwy N Brownsville, KY). This small town family-owned shop provides high-quality customer service, will pay attention to your needs, and a great selection of mattresses and other home furnishings. If you are looking for the best mattress stores in Owensboro, then you’re in the right place. We combed through all of the top-ranked mattress shops and selected only locations that offered quality products, customer service, and convenience-enhancing perks like reliable delivery and money-back guarantees. If you live in Owensboro, why not head to Bobby Wilson (601 E. 9th St.) where you’ll receive free delivery if your local. Check with the staff for details as this offer is made regionally. Not only that, but you will find a great selection of mattresses and other furniture for your home. The staff are friendly, knowledgeable and true to their word. Mattress Firm Clearance (5218 Frederica St.) offers a number of affordable mattresses for steep discounts. They always offer same-day or next-day delivery as well as a 120 night “sleep happy guarantee.” Mattress By Appointment (2606 W. 2nd St.) provides personalized customer service to help you find a mattress to meet your sleep needs. The owner has been in business for decades and is truly knowledgeable about their products. Sleep Number (5051 Frederica St. Suite 8.) is another mattress store that offers a customized experience. These are premium adjustable beds. Are you wondering where to purchase a mattress in Elizabethtown? That’s ok, you’re not alone. Though there are a number of mattress shops near Elizabethtown, not all offer quality customer service, affordable prices, and premium mattresses. We combed through the top-ranked mattress stores in the area and this is what we found: Mattress Firm Elizabethtown (1570 N. Dixie Hwy Suite 109). We recommend you speak directly to the store manager Steve with regards to your bed. He’s great, understand the products, and will do his best to ensure that your bed is delivered right on time. As always with Mattress Firm, you have 120 to test your mattress. When you shop at Mattress & More (1824 N. Dixie Hwy) the “more” just may be the honest and friendly customer service. The team really understands the product and can help you navigate your way through the shop with ease. If you are (like many couples) unable to agree on which mattress style is best, you could try a bed from Sleep Number (1570 N. Dixie Hwy Suite 104) where each side of the bed is can be tailored to meet you and your partner’s sleeping needs. Back pain, insomnia and much more can be addressed with the right fit. For a premium mattress (with an IQ of its own) try this location.